Superb Real Time Gaming software will enhance your online casino experience. Excellent Blackjack-exclusive bonus option for players who prefer table games. European players have double play through requirements. Our Old Havana Casino review illustrates why you have to look carefully at all the terms and conditions of casino bonuses and indeed of using any online casino at all. Although we concluded below that the casino is an excellent and potentially profitable destination for players from the US and Canada, we advise players from outside of these two countries to look elsewhere. 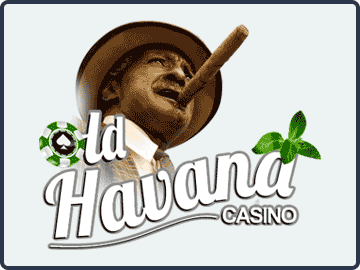 Old Havana Casino is one of the flagship sites of the Mainstreet Vegas Group – a UK-based company with a portfolio of trusted and established online casinos. Old Havana temporarily closed its doors in May 2014 so that it could have an overhaul and be brought up to the standard of the Group´s other sites. It reopened in November 2015 with a fresh new theme and a wide range of bonus opportunities. Games on the site are powered by Real Time Gaming and are available in a Windows-compatible download or in an “Instant Play” browser version. Where possible, we recommend the downloadable version of the software for its superior graphics and smoother gameplay. The fairness of the games and deposit/withdrawal options are unaffected by your choice of software. Like most of the other Mainstreet Vegas Group online casinos, there is a wide range of first deposit and reload bonuses at Old Havana Casino. As with the stipulation that European players have double play-through requirements, we recommended that the terms and conditions of each bonus offer are thoroughly reviewed before entering the appropriate Old Havana Casino bonus code. There are five different first deposit bonuses available for players. They differ by the percentages that are offered, the play-through requirements, the maximum bonus amounts and the games that are included/excluded from the play-through requirements. With the exception of the slots-exclusive and Blackjack-exclusive bonuses, there are two sets of play-through requirements. The lower play-through requirement applies only to slots and specialty games such as bingo and keno. The higher play-through requirement applies to slots, specialty games, video poker, Blackjack (and other 21 games) and Caribbean Stud. Wagers on any other games will not contribute to the play-through requirements for clearing a first deposit bonus. The first of the bonuses is the one that most people notice due to its prominent position on the casino´s home page. It has a play-through requirement of 40x or 60x depending on your choice of games, and the play-through requirement applies to both your initial deposit and the bonus amount. In order to take advantage of Bonus #1, enter the Old Havana Casino coupon code “Havana250” before making your deposit at the cashier. Although having a smaller bonus percentage, the second of the Old Havana Casino bonuses is much easier to clear. It has a play-through requirement of 30x or 60x before you are able to withdraw your winnings, and again the requirement applies to both the deposit and bonus amounts. To take advantage of this bonus opportunity, enter the Old Havana Casino bonus code “Havana200” before funding your account at the cashier. This bonus option is for those who want to maximize their bonus opportunities. Like the headline first deposit bonus, it has a play-through requirement of 40x if you play slots or specialty games, but the play-through requirement increases to 90x when you play any other qualifying game. The Old Havana Casino code to take advantage of Bonus #3 is “Havana150”, and, again, please enter the code at the cashier before making your first deposit. Bonus #4 is an excellent bonus for players who exclusively play slots, as it has a higher bonus percentage (300%), a higher bonus limit ($1,500) and lower play-through requirement (30x) than the headline bonus. Action on progressive slots does not count towards clearing the bonus, and is you want to take advantage of the Old Havana Casino slots bonus, enter the bonus code “Havana300” prior to making your first deposit. If you like playing Blackjack at online casinos, this bonus is especially for you. The Blackjack-exclusive bonus has a relatively easy play-through requirement of 60x before you can withdraw the bonus, and please note that action in Live Dealer Blackjack games does not count. To claim your Old Havana Casino Blackjack bonus, enter the coupon code “BJBONUSX2” before funding your account at the cashier. The list of additional bonuses available at Old Havana is exhaustive. Reload bonuses are available every day of the week – typically with a 40x/90x play-through requirement – and you will be offered special anniversary and birthday bonuses provided you keep your account “in good standing”. As you continue to play at the site, the bonus play-through requirements tend to decrease as you rise through the statuses in the VIP Loyalty program. At the highest status level, the play-through requirements are just 30x/50x, plus you will have free cash added to your account at the start of each month based on your action during the previous month. Once you get your head around the choice of deposit options, you then have to contend with the selection of games at Old Havana Casino. There are around 135 different slot games – mostly five-reel games, but plenty with different bonus options and opportunities to score with a big progressive jackpot win. New slot games are always being introduced at the casino, so you will never get tired of the choice. In addition to slots games, bingo games and keno games, there are twenty-two different table games and seventeen video poker games, including some great video poker games with jackpot bonuses, double bonuses, double double bonuses and mystery bonuses. As ever, it is always best to check the pay tables before you start playing video poker. Most of the games, although not contributing to the play-through requirements for the first deposit bonuses, reward your online action with Comp Points. Comp Points determine your status in the Old Havana Loyalty Program, which affects the play-through requirements for reload and anniversary bonuses, and also how much free cash will be deposited into your account at the end of each month. If you have any questions about fair play, or encounter any issues during your experience at the casino, Live Support is available around the clock and an email service with a 24 hour turnaround is also provided. Our limited interaction with the Live Support team was very positive and, although we only used it to verify our ID documents, found the representatives knowledgeable and friendly. Old Havana Casino dedicates a full page of its website to emphasize the efforts the site goes to in order to ensure fair play. It explains how the Random Number Generator is tested for fairness and accredited by CDS Technical Systems Testing. It also provides information about how payments are processed securely and personal information is protected. As we do not recommend Old Havana Casino for European players (because of the double bonus play-through requirements), we are only going to focus on the deposit and withdrawal options for US and Canadian players. Deposits (minimum $20.00) can be made via Visa and MasterCard credit and debit cards up to a maximum of $5,000. You can also fund your account with MST Gift Cards (up to $500) or MoneyGram (up to $870). Once your account has been verified, you can withdraw amounts up to $2,500 by couriered check or amounts up to $1,250 by ACH Direct Deposit (US players only). Withdrawals are free, but subject to minimum amounts (typically $100) and maximum limits per week according to your VIP status. Lower maximum limits start at $2,000 per week, and exceptions to the limits are made for large jackpot wins. Ignoring the double play-through requirement for European players, there was plenty to like about Old Havana Casino, but also a few things that irked us. No online casino fits all sizes, but our opinions about the site might influence your decision on whether Old Havana Casino is a venue you would like to try. The choice of bonuses is impressive, but read the terms and conditions first! The software driving the slots games in the downloadable client is excellent. The Comp Points Loyalty Program can significantly enhance your bankroll. We really did not like some of the RTG table games – particularly roulette. We feel that telephone support should be provided in addition to Live Chat. Casino tournaments are only available through the downloadable client. Compared with some other online casinos in the Mainstreet Vegas Group, this site stands out due to its wide selection of first deposit bonus opportunities. Although not as generous as some of its online casino partners, the Old Havana Casino bonuses suit every type of player; and, if you want more valuable bonuses, there is at least one reload bonuses available every day of the week. There is a big gulf in software quality between the games on the downloadable client and those available on the Instant Play version. Players using a Mac computer will get a more enjoyable experience elsewhere, but if you enjoy a wide variety of games, regular bonuses and a rewarding VIP loyalty program, there are few better places to spend your time than at Old Havana Casino. Visit Old Havana Casino Now!